Want to read one of the best books on corporate innovation? Pick up mine! I just got some great news that I wanted to share with you right away. Fupping.com has recently named my book "On the Brink: A Fresh Lens to Take Your Business to New Heights" to its list of 9 Best Books To Read On Corporate Innovation. "On the Brink" comes in at #7! Innovation, much like any other skill, takes work, strategy and structure to master. If you want to take your corporate innovation to the next level or create a corporate environment that fosters innovation and ingenuity, then these 9 books are a good starting point. Do you need to see your business with fresh eyes? My book is for you! In my award-winning book, I share seven amazing stories of companies who were “on the brink.” By stepping out and seeing their company and their markets with fresh eyes, they were able to turn around their businesses and re-ignite their growth. Readers get a crash-course in the business techniques of corporate anthropology that enable them to recognize unmet needs, tap into new markets and achieve “aha!” moments that can lead to meaningful innovation and growth. More and more, businesses from Microsoft to pharmaceutical companies to start-ups are finding that there is much to be learned by using anthropology and ethnographic observation to interpret how people actually see, feel and think and then turn these observations into innovative ways to drive change and meet consumers' unmet needs. These 3 blogs are an excellent window for you into that kind of thinking. 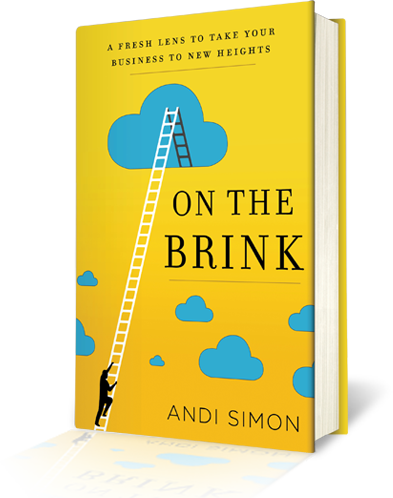 Are you "on the brink"? Give us a call. At Simon Associates Management Consultants, we specialize in helping companies learn how to integrate anthropology into their businesses so they can adapt to changing times before they're on the brink of crisis. Please contact us to discuss how we might help your organization thrive in these fast-changing times. We look forward to hearing from you.